Four men were arrested over the weekend and remain in custody today. Firearms seized by gardaí over the weekend. GARDAÍ HAVE INTERVENED in close to 50 situations where there was a credible threat to someone’s life in the ongoing gangland feud. Speaking today following four arrests over the weekend, assistant commissioner John O’Driscoll said that gardaí had been working hard to prevent gangland related killings. The Hutch and Kinahan crime gangs have been engaged in a feud over the past two and a half years that has so far led to 15 deaths. Gardaí held a media briefing after they foiled what they suspected was an attempted gangland hit on Saturday. Four men were arrested and remain in custody today. They are being questioned in relation to conspiracy to murder. 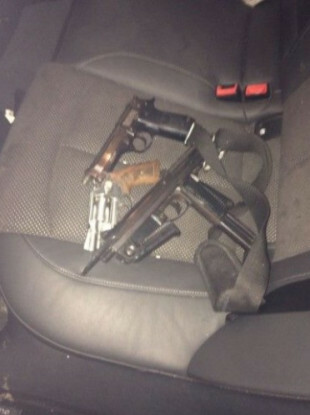 Three guns were seized at the time, described by gardaí as a sub-machine gun, a semi-automatic pistol and a revolver. Two more guns were later seized along with a silencer and a quantity of ammunition. Speaking to the media today O’Driscoll said that gardaí had intervened in close to 50 cases now where if they had not taken action they believe a murder would have taken place. “We believe if there had not been an intervention the death was imminent,” he said. As well as this, O’Driscoll said that seven people have been charged with conspiracy to murder and are before the courts in relation to a number of incidents. He described this as “unprecedented”. O’Driscoll said that there was great communication and cooperation between An Garda Síochána and international police forces in relation to tackling gangland crime. He said gardaí were working closely with British police and had worked with Dutch and Spanish police. “We engage with every jurisdiction where we think there is a link with organised crime in Ireland,” he said. When questioned over whether crime bosses or figures not living in Ireland or Europe were impossible to reach, O’Driscoll said that there was potential for charges to be brought against people not living here. “There is potential – despite the fact that people are outside this jurisdiction – that charges such as those relating to conspiracy to murder may be laid against people who are not in this jurisdiction,” he said. “Maybe there are people against whom we will allege are involved in organising some of the criminal activity that occurs in Ireland, organising it from a distance,” he said. All of that evidence will be gathered we will get the assistance of law enforcement in other jurisdictions and we will ensure that we sue all the relva international instrument to bring people to justice. Email “Gardaí have intervened in close to 50 attempted gangland hits”. Feedback on “Gardaí have intervened in close to 50 attempted gangland hits”.